Phototrophs are able to capture the energy in light thanks to photosynthetic pigments, like chlorophyll and bacteriochlorophyll, which absorb light energy kicking off a process that eventually results in the production of ATP. There are two main types of photosynthesis: those that generate oxygen (called oxygenic photosynthesis) and those that don’t (called anoxygenic photosynthesis). For the most part, oxygenic phototrophs have chlorophyll whereas anoxygenic phototrophs have bacteriochlorophyll. The overall structure of these two pigments is very similar. They both have the distinctive tetrapyrrole ring with a Mg2+ in the center and a long 20-carbon phytol tail that helps anchor them to the photosynthetic membrane. The differences occur in the substitutions around the ring and in the length and substitutions on the phytol tail. There are four different types of chlorophyll; a and b are the most common. There are also seven known variants of bacteriochlorophylls. These types of chlorophyll and bacteriochlorophyll differ in structure, and those differences affect the specific wavelength of light that each can absorb, which allows several different species of microbes together to collect the full spectrum of light, each absorbing a different range of wavelengths. Chlorophyll a absorbs red light (around 680 nm) and is the main pigment in higher plants, many algae and the cyanobacteria. Chlorophyll b also absorbs red light (660 nm) and is found in all higher plants, as well as a group of bacteria called prochlorophytes. 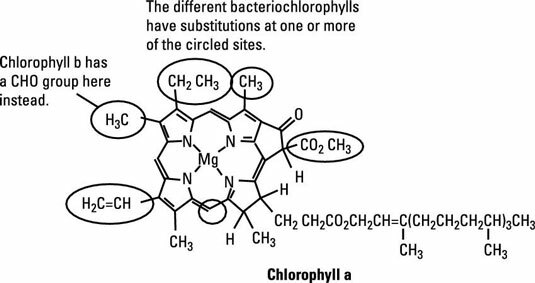 Chlorophyll c is found in eukaryotic microbes, like marine and freshwater algae, and absorbs red light (between 450 and 640). Chlorophyll d is found in a type of cyanobacterium that lives in areas lacking visible light, but containing infrared radiation (700 nm to 730 nm), like nestled underneath corals and algae. Bacteriochlorophyll a and b absorb infrared radiation (in the range of 800 to 1,040 nm) and are found in the purple bacteria. Bacteriochlorophyll c, d, and e absorb far red light (in the 720 nm to 755 nm range) and are found in the green sulfur bacteria. Bacteriochlorophyll cs also absorbs far red light (720 nm) and is found in the green nonsulfur bacteria. Bacteriochlorophyll g absorbs red or far red light (at either 670 nm or 788 nm) and is found in the heliobacteria. Another kind of photosynthetic pigment found originally in marine archaea but now known to be more widespread in the ocean is bacteriorhodopsin. Membrane proteins bind retinal pigments forming a light-driven proton pump. Most of them absorb green light (between 500 nm and 650 nm) and appear purple. This relatively simple pigment captures light without accessory pigments to act as antenna. The exact mechanisms of bacteriorhodopsin-driven carbon fixation are still being studied. Since their recent discovery, several other bacteria and archaea have been found to have bacteriorhodopsins with different adsorption spectra, allowing them to live at different water depths where the wavelengths of light available are filtered as depth increases. The kind of pigment-binding proteins present determine the absorption maxima for an organism. The absorption maxima is the range of wavelengths of light that provide the most energy to that organism. There are many types of these pigment-binding proteins, and their position around the light-harvesting pigments can change the spectrum of light absorbed. The combination of light-harvesting pigments and pigment-binding proteins is called the photocomplex and always occur within a membrane. The arrangement within a membrane is essential for creating the proton motive force necessary to generate ATP. The photocomplexes are organized so that there is a central reaction center (usually made of chlorophyll or bacteriochlorophyll) around which as many as 300 accessory pigments are arranged to gather up the light energy and pass it to the reaction center. When the surrounding pigments contain additional chlorophyll or bacteriochlorophylls, they’re appropriately called antennae, because they absorb as much light as possible and funnel it to the reaction center. The pigments in the reaction center participate directly in the reactions involved in converting light energy to chemical energy. This setup is especially essential for phototrophs that live in low light conditions. Photosynthetic membranes, which house the photocomplexes, occur in all phototrophs, but their structure can be very different in each organism. In eukaryotes, which have cellular compartments called organelles, it’s common to find structures called chloroplasts. The cyanobacteria have thylakoid membranes, which are not contained within a chloroplast. The purple bacteria use structures called lamellae, that are made by the inward folding of the cytoplasmic membrane and chromatophores, that are vesicular structures made from the membrane. The cytoplasmic membrane itself is used by the heliobacteria. The chlorosome, a specialized structure in the green bacteria, allows growth in environments such as deep in lakes and in areas that have the lowest light intensities. Instead of the antenna pigments surrounding the reaction center within the photosynthetic membrane, they’re arranged into dense arrays inside the chlorosome, which lies adjacent to the cytoplasmic membrane where the reaction centers are located.